Welcome to the January digital release blog hop!!!! The hop will run for 1 week and end on Wednesday 9th January at 12 Noon EST, when the lucky winners will be announced right here. Well I can't believe that another holiday seaon has past and now we arealready in the new year....2013. Well I hope thisd year brings each and everyone of you wonderful, positive and great things. All of the new images for January are wonderful. I hope that you decide to play along with our blog hop for a chance to win some great images. Here is my creation using this great new image. 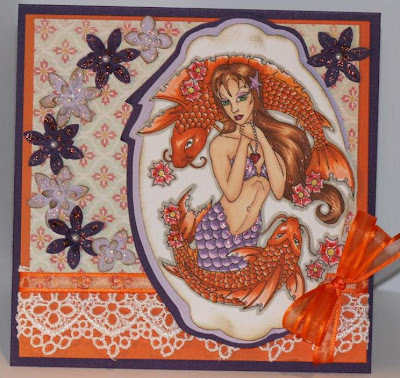 Supplies: Fanta Sea digi image from Whimsy stamps, copic markers, My minds eye patterned paper, Bazzill cardstock, Ek flower punces, martha Stewart floer punch, spellbinder, Kaiser craft pearls, robin egg beads,Ranger diamond stickles, lace. It's a beautiful image and you've chosen such great vibrant colors for this card! 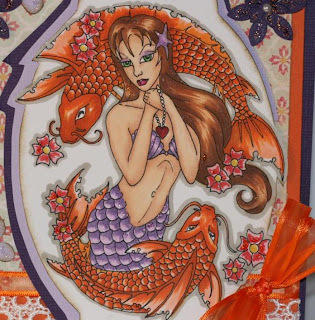 What a gorgeous card - love your coloring. So beautiful and love the color. Beautiful card...Whimsy stamps are the bomb! Gorgeous image. I love what you have done with it. I would never have thought of putting lilac and orange together....but I love it! Thanks for the inspiration. Gorgeous card. I really like the image and the colors you chose. I haven't tried Whimsy stamps yet. Now that I have my new computer, I want to try them. Wow friend, you made it amazing, great color choice,and I like the purple touch with it....awesome!